Homeschool - ALVS is a great fit for homeschooling. Enhance your homeschooling curriculum during high school with teachers who are experts in their disciplines. Partner with ALVS to support homeschooling during the high school years. 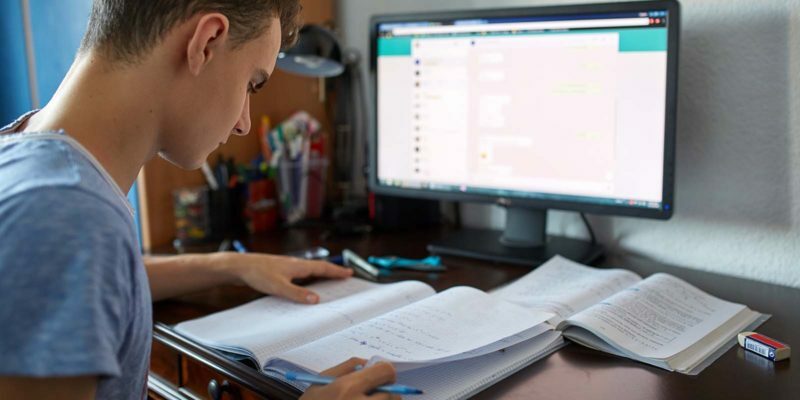 The ALVS team of experienced teachers and catalog of accredited online courses provide a solution for more complex high school subjects, including higher-level math, lab sciences, and world languages, as well as honors and Advanced Placement® (AP®) courses. Choose from over 100 individual courses to supplement the homeschooling curriculum. Accredited online high school content is an ideal fit with the homeschooling model. It can be a challenge to deliver advanced high school material to homeschool students. Choose our academically excellent online courses and you’ll have all that’s needed to successfully finish high school at home. Whether the course is Advanced Placement® (AP®), honors, or core, students can start any time of year and complete coursework as it fits their schedule. Our teachers challenge, support, and build relationships with each ALVS student to maximize academic success and learning engagement. Teachers are selected for experience — with an average of 21 years of teaching — and expertise in their subject area. ALVS homeschool students can access live interaction with teachers and tutors for the cost of the course. Live Tutor Chat is available Monday through Friday, 5 a.m. – 5 p.m. Pacific Time. A parent or at-home supervising adult serves as a coach and is key to the success of students enrolled. Weekly reports include information that makes it easy to monitor student progress and coordinate with ALVS teachers. I would like to thank you for all your help during my AP United States History online course. I appreciate your help in advancing the due dates for my assignments, which helped me finish the course quicker.